This week I'm writing my Christmas cards and starting to wrap gifts. We'll decorate our tree this weekend. We will be participating in a few Christmas celebrations already this weekend and it's so fun to be eagerly anticipating them rather than feeling overwhelmed with getting everything done. One thing that has helped me get more organized this week is this Christmas Planner from The Blog Guidebook. This planner includes calendars, a greeting card list, a gift organizing guide, a wish list, a shopping list, a menu plan, a grocery list, a place to record movies/specials that you want to watch, and a place to record your favourite Christmas games and activities. Plus, there are 2 pages of printable gift tags. It's a great place to record all the little details you need to remember this month! What I also like is that you can print as many copies of each page as you'd like and then put it into a binder or get it bound. It's really flexible. And not only will it help you get organized this year, you'll have a record of everything from this Christmas when you start preparing for next Christmas. If you're feeling overwhelmed preparing for Christmas, this is a simple way to get organized so you can spend more time enjoying yourself this season. Sound good? You can click here to purchase it. And if you buy it today (November 27) you can get it for only $0.99 instead of $2.99! Thanks to The Blog Guidebook, one lucky From Overwhelmed To Organized reader can win a copy too! There are several ways to enter below. Good luck! Note: I received a free copy of the planner to review. The opinions expressed in this post are 100% mine. Every year I say I should by presents a little bit at a time so it's not a mad dash in December--but I never do! It's weird that craziness and overwhelm have become as much a part of the holidays as hot chocolate and the Grinch. 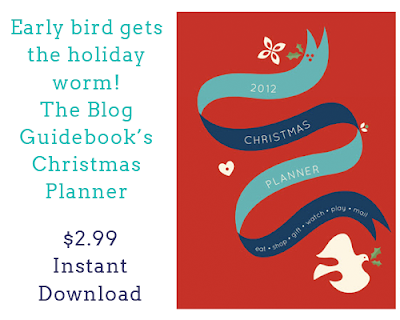 A Christmas Planner sounds like a good idea. Christmas can be overwhelming for sure! We streamlined to three gifts for our kiddos as well. 1- want, 1- gift of time, and 1-need. Makes it easier and each year we have a family memory with our gift of time.